Roumier’ 1990 Bonnes-Mares is the embodiment of everything a truly great wine should be at this stage in its life. Time has softened some of the Bonnes-Mares tannin, and yet the aromas and flavors remain remarkably fresh for a 27 year-old wine from a ripe vintage. Rose petal, lavender, red cherry, blood orange and plum are some of the many notes that develop as this spectacular, riveting Bonnes-Mares gradually opens up. Almost unbelievably beautiful and vivid in the glass, the 1990 simply takes over all the senses with its profound depth and stunning precision until all conversation stops at the table. Readers who own the 1990 can look forward to another 20+ years of magnificent drinking. 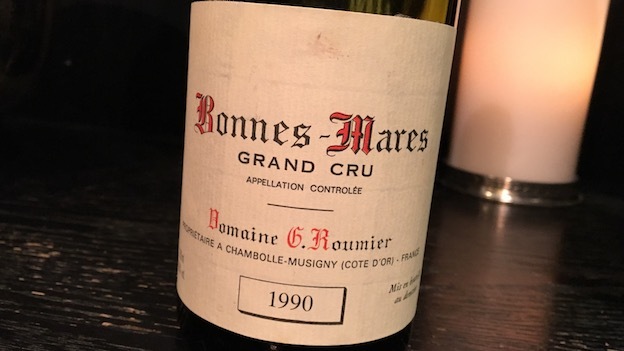 Roumier’s 1990 Bonnes-Mares is a Burgundy fit for kings and queens. I only hope I have a chance to taste it again someday! 98/Drinking Window: 2017-2027.